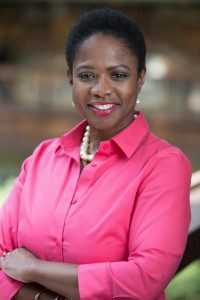 Sondra Samuels is not a shrinking violet who wilts under pressure or withers from conflict or criticism. 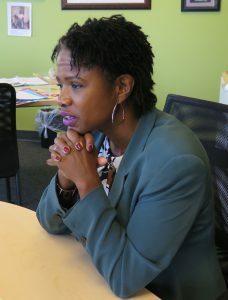 That’s part of the territory when you’re the CEO of the Northside Achievement Zone (NAZ), a partnership of community organizations and schools with a jaw-tightening task: to prepare 2,300 children in a 18 by 13-block square of North Minneapolis to graduate from high school and go on to college. If this job isn’t enough, add in her husband’s. Don Samuels was the 5th ward councilman and is now a member of the Minneapolis School Board. Sometimes the pace can be relentless, the criticism approaches nastiness and the goals can appear hopeless. These are times when Samuels, the girl who grew up in Newark, appreciates the Sisters who live in Minneapolis. They share a belief in society where character, conscience and courage replace color, class and creed to measure a person’s worth. Samuels remembers her first meeting with the Sisters, at a time when she and Don were grieving yet another gunshot death of a Northside teenager and confronting what they felt was unfair criticism from community loudmouths. Kind of amazing for someone who isn’t even Catholic. The Sisters feel their support of Samuels is being repaid in full by the work she is is doing in their backyard through NAZ, which got its start with a $26 million federal grant over five years. That funding is gone now and Samuels is working to raise $11 million a year from the coffers of the state, the city and corporate and private charities. Samuels is finely attuned to the complexity of life for minorities in America, dealing with the realities of discrimination and prejudice while avoiding the passiveness and pessimism that comes from playing “the victim” role. “I think Black Lives Matter, and the protests, cause me to say, ’They finally see us.’ They know we’re here,” Samuels said. “And our problems are the problems of all poor people and we do have to be working for all people. Samuels and the Sisters: a neighborhood partnership that gives hope to that future. Wonderful article! We are inspired by the work that Sondra is doing at the Northside Achievement Zone! 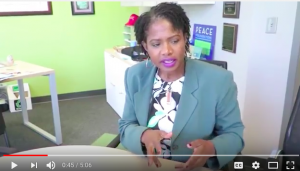 We have invited Sondra to speak about the intergenerational work she and parent leaders are doing to reduce poverty on the Northside at St. Patrick’s Annual Fall Forum, Bridging the Divide on Tuesday, October 11 from 6-8 p.m. It’s free and open to the community! We will also have a community meal! Please join us and invite friends and neighbors! You can register at St. Patrick’s website at http://www.stpatrick-edina.org.